This stove’s nautical styling recalls the coves and shores of Lake Sebago, locked amid the rock and pines of Maine. 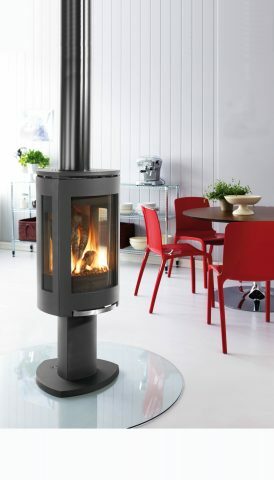 Fueled by the new pan style JøtulBurner™ and the cost saving IPI Proflame II ignition system, the Jøtul GF 400 DV IPI Sebago presents the perfect union of high efficiency and timeless design. With a new 7 piece hand crafted log set and enhanced fireview, the Jøtul GF 400 DV IPI Sebago is the perfect medium size heater for any home. multifunction Proflame II remote with flame modulation control, wall thermostat, top firing accent light kit (remote controlled with 6 level illumination), blower kit (120 CFM)(remote controlled with 6 speed levels), reversible brick liner (Antique Red & Brownstone), available in 3 colors (Majolica Brown enamel, Blue Black enamel or Classic Matte Black Paint).